A bridge link is a communication line that can transfer control messages from one network or node (such as an STP) to another network or node (such as another STP). Typically, b-links are used to interconnect peer (or primary) STPs to STPs from other networks. This figure shows the relationship between the link names and the link location (type). Signaling links are logically organized by link type ("A" through "F") according to their use in the SS7 signaling network. The "A" (access) links connect the signaling end points (e.g., an SCP or SSP) to the STPs. Only messages originating from or destined to the signaling end point are transmitted on an "A" link. The "B" (bridge) links connect the STP to another STP. The "C" (cross) link connects STPs performing identical functions into a mated pair. "D" (diagonal) links connect the secondary (e.g., local or regional) STP pair to a primary (e.g., inter-network gateway) STP pair in a quad-link configuration. 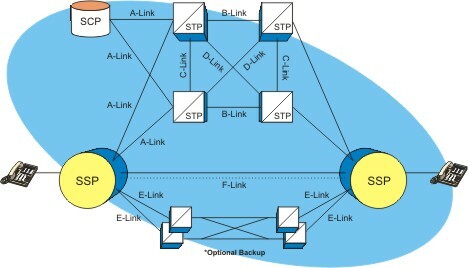 "E" (extended) links connect the SSP to an alternate STP. An "F" (fully associated) link is connected between two signaling end points (i.e., SSPs and SCPs).